Nature conspired in Eric Lionel Mascall (1905-1993) to flaunt St. Peter's image of the body as a collapsible tent (2 Pt 2:13-14) at least I have not known such an agile mind in such a clumsy frame. He once stumbled over himself in the dark, and only his groan prevented me from stepping on his valuable head. And he was something of an innocent, too: When my parents had him to Easter dinner in a Manhattan restaurant, he had no idea why someone was dressed as a rabbit for the children. There are no conclusive theological reasons for rejecting the notion that, if there are, in some other part or parts of the universe, rational corporeal beings who have sinned and are in need of redemption, for those beings and for their salvation the Son of God has united (or one day will unite) to his divine Person their nature, as he has united it to ours . Having known him since 1968, our friendship grew when I joined the Oratory of the Good Shepherd, an Anglican version of the French Oratory of de Bérulle. The Cambridge dons who started it after the First World War were solid figures like Father Wilfred, one of the stellar Knox Brothers. Annual retreats in England, I being one of the rare Americans, introduced me to some of the most affable men I have known, perpetuating the spirit of Little Gidding, which had been a model for the life they wanted. It was a wonder that Eric patiently abided the fraternity of the modernist Alec Vidler, for they were as night and day. Alec, who gradually sank into skepticism as his best friend Malcolm Muggeridge rose to belief, finally allowed that the only article of the Creed he knew to be certain was that Jesus had been crucified under Pontius Pilate. Alec grew a long white beard, which amused the queen when he was a canon of Windsor. He also was Mayor of Rye, having been born there next to Henry James's house. C. S. Lewis was less patient with Alec than Eric was, and found it quite remarkable "that we should have had to wait nearly 2,000 years to be told by a theologian called Vidler that what the Church has always regarded as a miracle was, in fact, a parable." Eric foresaw the decline of his ecclesial Communion and left me with no doubt that, had he lived, he would have acknowledged the infallibility of the pope. On a retreat at the Catholic abbey at Worth, he bid me spend a whole rainy day with him while the others went on an outing to the Brighton Pavilion: "Little do they know, George, that George IV's batterie de cuisine on display is actually that of Wellington." When Elvis Presley died, I spread a rumor that the most unlikely Eric had been a devoted fan, and by evening he asked me, with his unmistakable speech impediment, "Why are all the bwothers condoling with me about Elwis Pwelsey?" He spent a weekend in the lodgings of Professor Ian Macquarrie at his beloved Oxford, under the impression that Mrs. Macquarrie was the housekeeper. Saintly Ian told me that as affectionate evidence that the celibate Eric was not of this world. The faith which the Church has proclaimed throughout the ages, embraces and coordinates a wider range of human experience, opens up more possibilities of human living and offers in the end a deeper and richer ecstasy of fulfillment than any alternative way of life and thought . On talent nights during retreats, one of the brethren with a gift for sound effects ritually imitated railroad engines and then, after some weak sherry, Eric would read one of his limericks, which eventually were published. Whenever I have a glass of Sandeman, I mutter the one about an altar boy of Dun Laoghaire who stood on his head for the Kyrie. 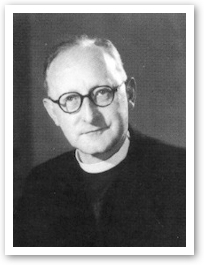 Father George William Rutler. "Eric Lionel Mascall." excerpt from Cloud of Witnesses: Dead People I Knew When They Were Alive (New York: Scepter Publishers Inc., 2010): 134-136. This excerpt is reprinted with permission from Scepter Publishers Inc. This article appeared first as one of the "Cloud of Witnesses" columns Father Rutler wrote for Crisis. It is included in his book, Cloud of Witnesses - Dead People I Knew When They Were Alive.